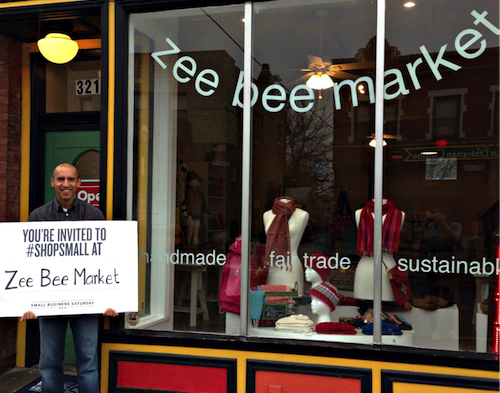 This post originally appeared on The Chicago Council on Global Affairs’ Global Insight. In late January, Welcoming Economies Global Network member Global Detroit was honored to receive one of the first-ever Renewal Awards, created by the National Journal and Atlantic magazines with Allstate, to recognize the innovators, grassroots organizers and problem-solvers who are making progress against the greatest challenges facing America. The awards identify and celebrate the efforts of six nonprofit initiatives across the country that are tackling vital issues, from education to economic opportunity, from health care to neighborhood revitalization. National recognition of Global Detroit and its immigrant economic development efforts in Detroit signals widespread acceptance of immigration as an economic development and community renewal strategy. Global Detroit received this prestigious national award on the 5th anniversary of the beginning of its first programs. In the five years since the Global Detroit study and plan were unveiled in 2010, Global Detroit has worked with its partners across metro Detroit to implement no fewer than eight of the eleven strategies in the original Global Detroit study to help the region’s economic recovery by leveraging international talent to fill regional businesses’ unmet talent needs, catalyzing the growth and development of immigrant entrepreneurs, and building a global region with competitive advantages in job creation, business growth, and community development. Where these ideas were once met by curious looks, they are now met with interest by peers across the Midwest and Northeast, and encouraged by the support of the Network. The environment to renew America’s economy is being set by Global Detroit and its Network peers. Research into the economic impact of immigrants and refugees is easier to come by, and tangible outcomes of immigrant economic development work are evident across the Welcoming Economies Global Network. 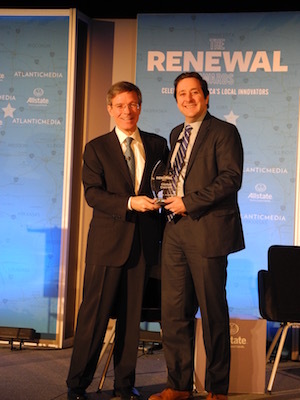 The Renewal Awards celebrate innovators that are renewing America from the ground up despite a na­tion­al sys­tem mired in stale­mate. Immigration reform is no stranger to stalemate, and any type of meaningful reform appears no closer despite immigration’s now constant (and heated) seat on the political stage. Despite the gridlock in Congress, however – or perhaps because of it – local and regional efforts to effectively integrate immigrants and refugees have surged with newfound allies and energy. Over the last few years, the growth in both number and scope of these programs is astounding, and reveals a strong momentum in the emerging field of immigrant economic development. This award, an incredible recognition of how far local immigrant economic development efforts have come, honors Global Detroit and motivates its staff, board, supporters, and partners to continue to help revitalize Detroit and the metro region. Our nation still has much work to do to make America the best it can be for all its residents. 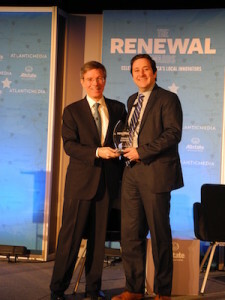 We hope the Renewal Award is a catalyst for others to work with immigrant communities producing economic opportunity for the entire region by welcoming immigrants and encouraging regional economic development efforts to play a role not just in attracting immigrants, but also in retaining them and in enhancing their role in the community’s economic and social fabric. The beginning of 2015 was such a flurry of WE Global activity that I am having difficulty understanding how we accomplished so much. As we launch into 2016, I look forward to what I expect to be a year of promise, impact, and growth. But as we enter a year of exciting opportunities, I thought it important to reflect on just how much WE Global accomplished in 2015. City-to-City Visits – 2015 began with a burst of intense networking and relationship-building as 12 WE Global cities participated in 6 city-to-city visits during January and February to learn about the emerging work across the region. “A Day in the Life of an Immigrant Entrepreneur” Story Contest – Partnering with our friends in ethnic media at New American Media, WE Global hosted an 11-city immigrant entrepreneur story contest and published a storybook in February with all 11 winners, including awarding a $1,000 prize (drawn at random) for Julio Zegarra-Ballon, a Peruvian immigrant in St. Louis who renovated a vacant space to create Zee Bee Market and offer beautifully hand-crafted Fair Trade products from around the world. H-1B Day of Action –Several WE Global members joined with local chambers of commerce to build public awareness of the contributions that high-skilled immigrant labor makes to job creation and regional prosperity. Launch of WE Global Network – In April the Welcoming Economies Global Network (WE Global) officially launched as a program of Welcoming America. 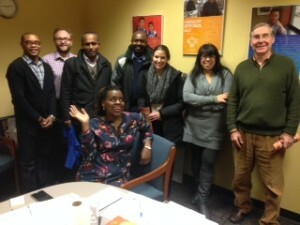 Immigrant Heritage Month – In June, WE Global members worked with welcome.us to celebrate Immigrant Heritage Month. 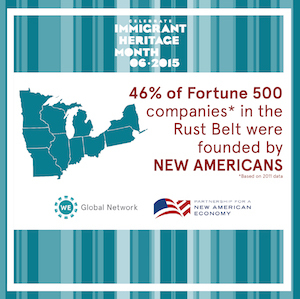 WE Global partnered with the Partnership for a New American Economy to highlight the historic contributions of immigrant businesses in the WE Global states by analyzing the “New American” Fortune 500 firms—the Fortune 500 firms started by immigrants or their first generation children—in each state. 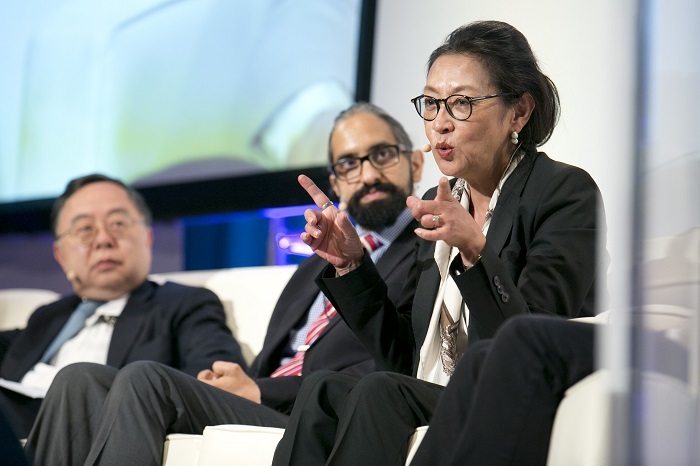 White House Task Force on New Americans – In April the White House issued the first-ever federal strategic action plan on immigrant and refugee integration and mentioned the WE Global Network as a promising practice in building welcoming communities that focus on the economic development opportunities around integration. WE Global has continued to help bring this plan into reality, including participating with many WE Global members at the White House Building Welcoming Communities Convening in Washington, D.C. this October. Developing Vacant Property Solutions – In May, WE Global was asked by the Center for Community Progress to convene the first-ever discussion of immigrants and land banks at the National Reclaiming Vacant Property Conference in Detroit. 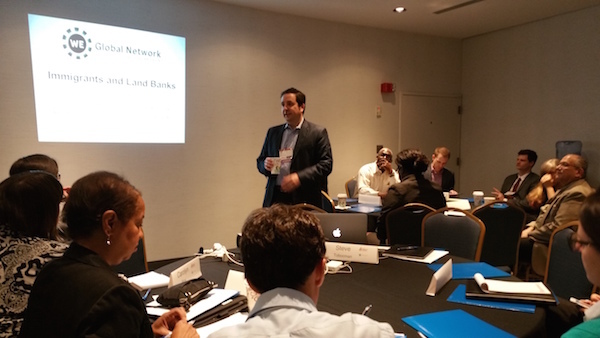 Nine of the nation’s largest land banks joined WE Global and national partners Partnership for a New American Economy and the Legacy Cities project to discuss the opportunities that can result from connecting land banks and vacant properties with immigrants and refugees. This initial conversation served as the impetus for a forthcoming research report exploring these opportunities in greater detail. Dayton Convening – Probably the highlight of the year was the third annual WE Global Convening in Dayton in July keynoted by the White House’s Felicia Escobar. 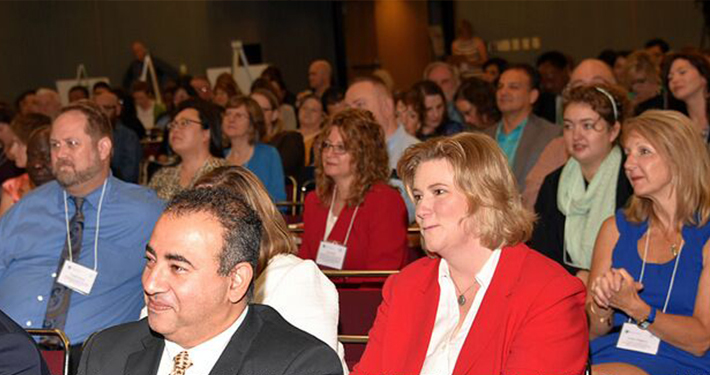 Some 300 attendees from 25 Midwest communities attended the gathering which was characterized by the relationships that were built among practitioners. Welcome Dayton did stellar work as our host and the convening coincided with the release of new research by the Partnership for a New American Economy about how Dayton has benefitted from Welcome Dayton and the growth of its immigrant population. Guide to Immigrant Economic Development – In conjunction with the Dayton convening in July, Welcoming America released its Guide to Immigrant Economic Development written by WE Global Co-Chair Steve Tobocman (with tremendous help from Global Detroit staff, as well as Welcoming America’s Susan Downs-Karkos and Rachel Peric). 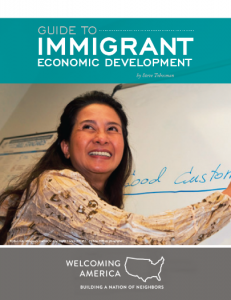 The Guide includes 13 chapters to help local economic development agencies, chambers, mayors, city councils, nonprofit organizations, and advocates develop innovative programming that integrate immigrants and refugees into their local economies to create jobs and growth that impact the entire region. CEOs for Cities, National Immigrant Integration Conference, and other speaking engagements – Throughout the year, WE Global was invited to present the exciting work going on throughout the Network to a wide variety of audiences, including CEOs for Cities, the National Immigrant Integration Conference, refugee resettlement groups, and even a state health endowment. In 2016 we hope to connect our innovative perspective with more diverse audiences of economic development actors, business leaders, and local officials.